This one's really more of an art project than anything... in fact, I used it as one for school. The frame, I got for about a dollar at a Goodwill. I sketched out the beginnings of a portrait of a random, wealthy-looking man on it... then sort of let it sit for a while. A while later, a project came up in one of my classes, to do a piece of artwork based off of a certain artist we were researching. 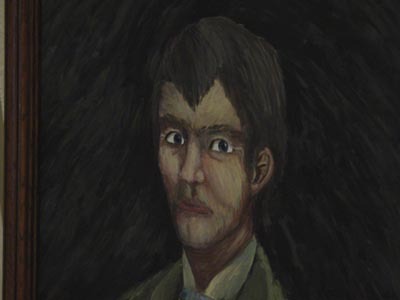 I happened to be doing my project on Vincent Van Gogh, who did a good deal of semi-abstract, often rather creepy-looking portraits. I decided to imitate his style to paint this portrait. Rather than just paint the eyes, I cut them out. I was painting on a pretty thick piece of illustration board, and the effect I wanted to try for was making the eyes of the portrait literally follow people around. 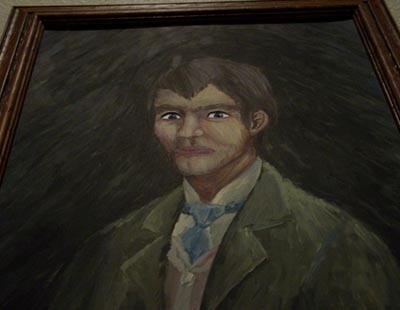 I painted the eyes separate, then attached them behind the portrait, so they were visible through the holes. 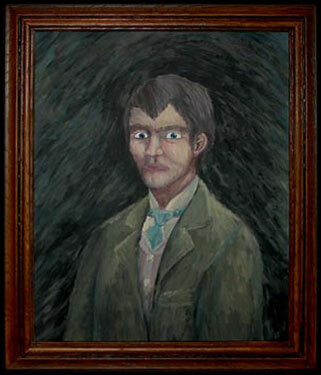 That gave the illusion that no matter where you looked at the portrait from, it's eyes would always be right on you. You can see this effect in the images below. Click the thumbnail for a bigger image.